04 Sep, 2017 by	Margaret M.
Trump dominated social media during last year’s election. The most important rule to follow online is to never respond to someone trolling you, but Trump’s haters fall for it every time. Ideas and jokes online are loosely called memes. A good meme gets shared quickly and has a message that without an accompanied funny photo would never get the same traction. On Facebook you’ll get more replies and shares if you post a funny photo of a cat along with your status update because people will notice the picture and want to spread that picture around. Trump posts, reposts and retweets memes that are guaranteed to get a reply from his haters, which in turns allows his supporters to make fun of everyone who made the personal decision to be personally insulted by the joke. Donald Trump himself retweeted it to his 37.5 million followers. Seriously, the situation in Texas right now and Trump thinks this is what he should be tweeting? They’re SO ANGRY! And all they’re doing is spreading Trump’s “I happened!” message even further! Worthy of a troubled adolescent, but no #POTUS, good or bad, has been this petty, or so obsessed with an election that is over. I always have time for an election win brag, even in the midst of a natural disaster and potential nuclear war. 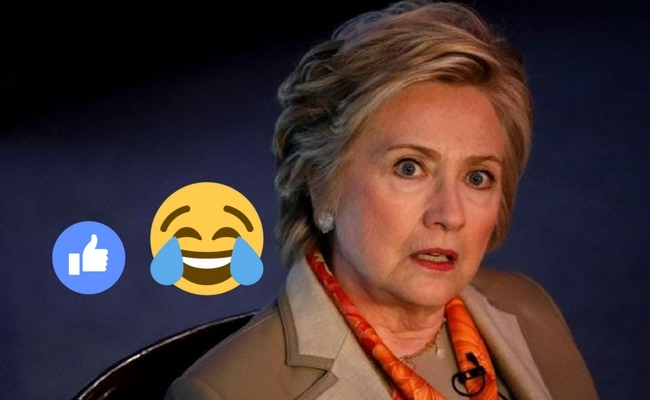 People have been dunking on Hillary since her book was announced, pointing out that what happened was that she ran a bad campaign. 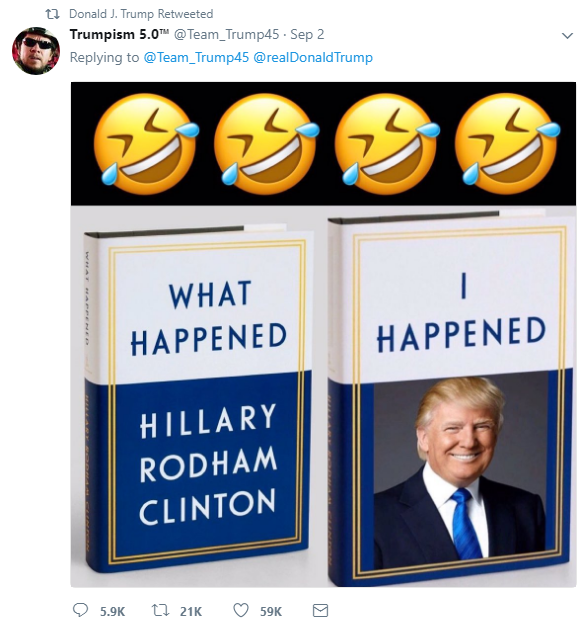 Hillary writes a book on "What Happened"
In July, the same group of extremely upset Democrats flipped out when Trump retweeted a wrestling gif of him beating up Vince McMahon, with a CNN logo pasted over Vince’s face. The tags #FakeNews and #FraudNewsCNN went viral. What happened after that was disgusting: The teenager who made the original gif was tracked down by CNN and threatened into apologizing for hurting their feelings or else CNN would release his real name to the world. They literally can’t even take a joke without threatening to destroy the life of a high school kid who made a funny edit to a video. Talk about sheltered, sensitive reporters! Even Chelsea got on her high horse to moralize about the gif, proving for once and for all that Democrats think they’re better than every other stupid person who watches things like wrestling or monster truck rallies. Sorry, honey, we aren’t all interested in paying thousands of dollars to watch Hamilton The Musical.